ecently, a number of creationist individuals and organizations have created websites touting the woodpecker as an example of an organism which "could not have evolved." In making their case, they have presented a great deal of information which is either distorted or patently false concerning the anatomy and physiology of the woodpecker, particularly with regard to its astonishingly long tongue. The purpose of this website is to provide accurate information to those who might otherwise take the erroneous claims of creationists at face value. The woodpeckers (family Picidae) are familiar birds whose unique anatomy allow them to exploit unusual ecological niches. Many of the species in this family display interesting adaptations which allow them to drill holes in solid, unrotten wood in search of insects and other prey. One of the most fascinating of these adaptations is the woodpecker’s tongue. Unlike the tongues of humans, which are primarily muscular, the tongues of birds are rigidly supported by a cartilage-and-bone skeleton called the hyoid apparatus. All higher vertebrates have hyoids in one form or another; you can feel the "horns" of your own u-shaped hyoid bone by pinching the uppermost part of your throat between your thumb and forefinger. Our hyoid serves as an attachment site for certain muscles of our throat and tongue (1). The Y- shaped hyoid apparatus of birds, however, extends all the way to the tip of their tongues. The fork in the "Y" sits just in front of the throat, and it is in this area that most of the muscles of the hyoid attach. Two long structures, the "horns" of the hyoid, grow backwards from this area and provide insertion sites for protractor muscles which originate on the lower jaw.The hyoid horns of some species of woodpeckers are quite startling in appearance, as they can grow all the way up to the top of the head and, in some species, grow around the eye socket, or even extend into the nasal cavity (2), (3). The unusual appearance of the woodpecker’s "tongue skeleton" has inspired creationists to use it as an example of a structure too bizarre to have evolved through chance mutations which produced functional intermediates. As the following information shows, however, the strange tongue of woodpeckers is actually just an elongated version of that found in all birds, and is in fact a perfect example of how anatomical structures can be shaped into new forms by mutations and natural selection. 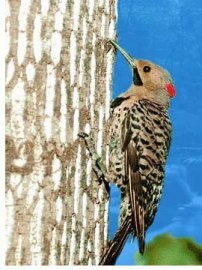 Several creationist websites and tracts which I have come across claim that the woodpecker’s tongue "is anchored in the right nostril,"(C1) or grows "backwards" out of the nasal cavity (C2). The primary connections between the woodpecker's hyoid apparatus and the rest of its body are muscles and ligaments which attach the hyoid to the mandible (jawbone), cartilage of the throat, and base (not top) of the skull - the same configuration found in all other birds. In the adults of a few species, the hyoid horns may eventually grow forward and into the nasal cavity from above - however the hyoid and the tongue certainly do not grow FROM the nasal cavity. The avian tongue proper covers the anterior part of the hyoid apparatus - the posterior parts, including the hyoid horns, function as a support structure. The lengths of the hyoid horns in different birds vary quite a bit, but they are all functionally quite similar. The chicken (figure 3A) gives a well-studied example of a bird which is not closely related to the woodpecker, yet shares all the essential features of woodpecker hyoids (figure 3B). Figure 3: (A) The jawbone and hyoid apparatus of the chicken (Gallus gallus, left) and (B) the Red-Bellied Woodpecker (Melanerpes carolinus, right). Compare to the chicken hyoid to the woodpecker hyoid. Note the branchiomandibularis muscles (Mbm) which wrap around the hyoid horns and attach to the jaw. The attachments are similar in the flicker, but the horns and Mbm muscles are longer. Figures reproduced from (3) and (6). The hyoid horns of the chicken and the fascial sheath in which they rest (the fascia vaginalis - Fvg) extend backwards on either side of the throat, then curl up behind the chicken's ears to the back of the head (figure 3A). The sheath itself forms from a sack of lubricating fluid which the horns grow into as they develop. This lubrication gives the horns some freedom to slide up or down the sheath as the tongue is pulled in or out. There are some elastic connections between the sheath and horns, but they are certainly not "anchored" to the skull. Note the attachments of the branchiomandibularis muscles (labeled "Mbm"), which connect near the end of the hyoid horns, run down through the "sheath," and attach to the middle of the jawbone (attachments labeled "Mbma" and "Mbmp"). These are the muscles which slide the horns down in the sheaths, tighten them against the skull, and thus extend the rigid avian tongue (4). Thus, the twin horns of a bird's hyoid serve only as an attachment site for muscles which actually originate in the lower jaw - contraction of these muscles pulls the horns, and the whole hyoid apparatus, forward and against the skull, thrusting the tongue out of the mouth like a spear. Once this concept is understood, it is obvious that lengthening the hyoid horns and attached muscles, without making any other changes to overall structure or function, would effectively give the bird a longer tongue and allow it to protrude that tongue farther out of the mouth. In fact, this is exactly what happens as a young woodpecker grows into an adult. When a flicker is hatched, its hyoid horns extend only to behind its ears, like those of a chicken. As it grows, the sheath, horns, and muscle grow longer, curving forward over the head and into the nasal cavity (5). 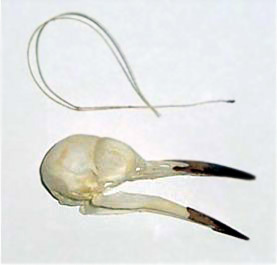 Figure 4: Diagram of short- (left) and long-tongued (right) woodpecker skull and hyoid apparatus. Maroon bands show action of branchiomandibularis muscle (Mbm) during tongue extension. Attachments of Mbm to hyoid horns and mandible (jawbone) are shown in purple. Compare to attachment sites "mbm," "mbma" and "mbmp" in figure 3. Green arrows demonstrate direction of movement of hyoid horns during shortening of Mbm's. In birds with longer horns, a great deal of slack is present in the horns at rest, and the contraction of the Mbm's pulls them straight and tight to the skull as the tongue is extended. 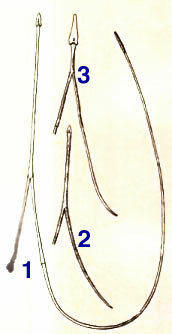 Thus, in some species, the sliding of the tips may be minimal (see figure 4) (6). Compare the horns of the chicken hyoid (figure 3) with those of the adult flicker (figures 4 and 5.1). Notice that although the flicker horns are far longer, they each contain two bones (the ceratobrancials and epibrancials) and one tiny joint, with a piece of cartilage on the tip of the epibranchial - just like the chicken. There are a few other minor morphological differences, such as the presence of the urohyale bone (UH) in the chicken, but the overall homology is clear. Figure 5: (1) Hyoid of flicker (Colaptes auratus) (adult). (2) Hyoid of flicker (Colaptes auratus) (recently hatched). (3) Hyoid of red-naped sapsucker (Sphyrapicus varius nuchalis) (adult). Diagram and legend reproduced from (4). As mentioned earlier, the hyoid horns of a hatchling flicker (and other long-tongued woodpeckers) are quite short (see figure 5.2) and are comparable to those of short-tongued species of woodpecker such as the sapsucker (fig 5.3) which, in turn, has hyoid horns no longer than those of many songbirds (5). It is only with age that the hyoid horns of the flicker grow up to the top of the head, forward, and into the nasal cavity, where the sheath fuses to the nasal membrane. This makes adaptive sense, since the young flicker is fed by its parents, and a long tongue would only get in the way. The genetic changes necessary for such a modification are quite minor. No new structures are required, merely an extended period of growth to lengthen an existing structure. It is likely that in ancestral woodpecker species which began to seek grubs deeper in trees, those woodpeckers with mutations for increased hyoid horn growth had a fitness advantage, as they could extend their tongue farther to reach prey. Some woodpeckers have no need for long tongues, and thus genes which shortened the hyoid horns were selected for. The sapsucker,(2) for example, drills tiny holes in trees and then uses its short tongue to eat the oozing sap on the tree's surface (and insects which stick to it). Many other interesting adaptations are seen in different species of woodpeckers. Some species, for example, have modified joints between certain bones in the skull and upper jaw, as well as muscles which contract to absorb the shock of the hammering. Strong neck and tail-feather muscles, and a chisel-like bill are other hammering adaptations which are seen in some species. The same creationist sources which present inaccurate information about the tongue often claim that the sheer number of adaptations found in woodpeckers provide an argument against evolution. They state that all of these adaptations would have to have came about "at the same time," or they would all have been useless. Of course, such an argument ignores the fact that many species of woodpeckers alive today lack these adaptations, or possess them in a reduced form. The flicker, for instance, uses its long tongue primarily to grab prey from the ground or from under loose bark. It has few shock-absorbing adaptations, and prefers to feed on the ground or to chip away at rotting wood and bark, habits observed in birds outside of the woodpecker family (7). A "continuum" in skull structures, from little- to highly-specialized for pounding is seen in different genera (groups of related species) of woodpeckers alive today. (8) In his classic "Birds of America," John James Audubon describes the slight gradations in hyoid horn length found in different species of living woodpeckers (9). The wrynecks and piculets, members of the woodpecker family which look something like a cross between songbirds and woodpeckers, have many woodpecker-like adaptations, such as long tongues. However, they do not possess stiff tail-feathers or certain other hammering specializations. They are thought to be similar to the ancestral species of today's specialized woodpeckers. C1. Answers In Genesis: - This organization sells a CD with "information" like this to be taught to children. "Second, how could the unique arrangement for the woodpecker’s tongue have evolved, if, in the beginning, its tongue was anchored in the back of the beak, as it is in ordinary birds? How did the tongue manage to move into the right nostril? If the anchor suddenly hopped from the back of the beak up into the right nostril, the tongue would be too short. And during all the intermediate stages, would the tongue have been long enough to reach the insects and worms inside a tree so the woodpecker could eat and survive?" C2. Creationism.org: - The author of this page claims to be writing a book called "Answers to my Evolutionist Friends." "Evolutionists surmise that the woodpecker must have evolved from other birds with normal tongues that go straight out of the beak. The small mutation scenario, however, could never have evolved the woodpecker's tongue because far from adding to the bird's ability to survive, after turning backward, the tongue would have been completely useless until it had completed the entire circle. Only the last step in the evolution of the woodpecker's tongue, that of coming back into the beak had survival value. To explain further, a tongue rooted in the nostril facing backwards would have been a great survival disadvantage until the moment the tongue and its bones had grown long enough to go all the way around the neck, back into the base of its beak, and extend far enough out the end to reach food." "Most birds have a tongue and a beak about the same length. The tongue of the woodpecker has evolutionists scratching their heads. It can be stretched far beyond the tip of the woodpecker's beak as it searches the larval tunnels for food. The tongue of some woodpeckers does not come from its throat up into its mouth like other creatures. The European Green woodpecker's tongue goes down the throat, out the back of the neck ... around the back of the skull beneath the skin, and over the top between the eyes, terminating usually just below the eye socket. In some woodpeckers the tongue exits the skull between the eyes and enters the beak through one of the nostrils!" 4. Homberger, DG and Meyers, RA. 1989. Morphology of the Lingual Apparatus of the Domestic Chicken, Gallus gallus, With Special Attention to the Structure of the Fasciae, The American Journal of Anatomy, 186: 217-256 - Very detailed anatomical description of the jaw and tongue structures of the most studied avian species. 5. Lucas, FA. 1895. The Tongues of Woodpeckers. U.S. Dept. of Agriculture. Division of Ornithology and Mammalogy. Bulletin no. 7 - Nice diagrams of the hyoids of different species, as well as adult vs. hatchling flickers. 6. Bock, WJ 1999. Functional and Evolutionary Morphology of Woodpeckers. The Ostrich, 70: 23-31 - A complete and up-to-date functional analysis of woodpecker tongue and skull adaptations. 7. Short, LL. 1973. "Woodpecking" by a Red-Throated Barbet. The Auk, 90: 909-910 - This source describes woodpecker-like hammering and feeding in species outside the woodpecker family and sharing no woodpecker-unique adaptations. The author provides an interesting hypothesis for the evolutionary divergence of woodpeckers and barbets. 8. Kirby, VC. 1980. An adaptive modification in the ribs of woodpeckers and piculets (Picidae). The Auk, 1980; 97(3): 521-532 - Describes a continuum of rib adaptations in less- and more-specialized woodpecker species. Comments on earlier work which found a similar continuum in skull specializations (Burt, WH. 1930. Univ. California Publ. Zool. 32: 455-524). "There is a very curious gradation in the degree of elongation of the horns of the hyoid bone in the different American Woodpeckers, some of which consequently have the power of thrusting out their tongue to a much greater extent than others. Thus: In Picus varius [Yellow-bellied Sapsucker], the tips of the horns of the hyoid bone reach only to the upper edge of the cerebellum, or the middle of the occipital region. In Picus pubescens, they do not proceed farther forward than opposite to the centre of the eye. In Picus principalis, they reach to a little before the anterior edge of the orbit, or the distance of 1/2 inch from the right nostril. In Picus pileatus, they extend to half-way between the anterior edge of the orbit and the nostril. In Picus erythrocephalus, they reach to 3 twelfths of an inch from the base of the bill. In Picus tridactylus, they reach the base of the ridge of the upper mandible. In Picus auratus [Nothern Flicker] , they attain the base of the right nasal membrane. In Picus canadensis, they curve round the right orbit to opposite the middle of the eye beneath. Lastly, in Picus villosus, they receive the maximum of their development, and, as represented in the accompanying figures, curve round the right orbit, so as to reach the level of the posterior angle of the eye." [Note - many of the latin names used by Audabon do not reflect current usage and classification]. "In considering the Origin of Species, it is quite conceivable that a naturalist, reflecting on the mutual affinities of organic beings, on their embryological relations, their geographical distribution, geological succession, and other such facts, might come to the conclusion that each species had not been independently created, but had descended, like varieties, from other species. Nevertheless, such a conclusion, even if well founded, would be unsatisfactory, until it could be shown how the innumerable species inhabiting this world have been modified so as to acquire that perfection of structure and co-adaptation which most justly excites our admiration. Naturalists continually refer to external conditions, such as climate, food, &c., as the only possible cause of variation. In one very limited sense, as we shall hereafter see, this may be true; but it is preposterous to attribute to mere external conditions, the structure, for instance, of the woodpecker, with its feet, tail, beak, and tongue, so admirably adapted to catch insects under the bark of trees." Thanks to Jorge de Leon and Kristof Zyskowski of the Yale Ornithology Library.